Every spring and summer around 500 young birds are brought to Gower Bird Hospital. We have been raising nestlings and fledglings every year for more than ten years and learned a great deal in this time. Raising a nestling or fledgling is not just feeding and releasing. To have a real chance of survival in the wild, the birds must be able to function in exactly the same way as their wild counterparts. If a bird becomes tame it can grow up to believe that humans are its parents. This will often result in the bird having problems socialising with its own species and even looking at humans as possible sexual partners. If it is a large bird such as a buzzard or crow, there is a real danger of injury - the bird will try to land on your head and a beak or talon could take an eye out. Often the bird is rejected by its own kind as it doesn't communicate properly so it will be attacked as the wild community realises that it doesn't fit in. It can be a real problem if a single nestling or fledgling arrives, as it needs the company of its own species to avoid becoming dependent on us. Fortunately, Gower Bird Hospital receives so many different patients that a single individual can be introduced into a similar age group already at the Hospital. Each species has its own natural history - what does it feed on and what is the normal behaviour of the species? How does it find food in the wild? Feeding a young blackbird exclusively on cat food and then releasing it will probably result in it looking for cat food in the wild instead of its natural food source. At Gower Bird Hospital, every effort is made to provide as natural an environment, with the correct food source, as possible. Some birds are altricial - born blind and bald - they need constant attention from the parents to survive. After three to four weeks in the nest they fledge but are still dependent on the parents. The parents continue to feed the youngsters and at the same time teach them how to find food such as insects, worms, fruits and carrion. We have no option but to hand-feed these youngsters and it would be very easy to produce tame birds, which would have a much lower chance of survival when released. To avoid this we have a strict protocol of not talking to the birds at all and as soon as they have enough feathers to keep themselves warm, the substitute nest is moved into an outside aviary. It is important that they see the sun rise and set, experience different weather conditions, hear natural sounds and see a natural environment. As much natural food is supplied as possible and the aviaries are designed to attract insects inside. When the birds fledge out of the nest, we continue to hand-feed for a few days but also keep an eye on them through the CCTV cameras. When we see the youngsters foraging and finding food for themselves we stop hand feeding and supply earthworms, mealworms and extra insects such as grasshoppers and fruit flies. 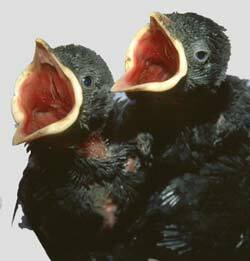 An important consideration is how many broods are raised per year. Birds that raise just one brood every year (such as the jackdaws and bluetits pictured here) are more susceptible to becoming tame. The youngsters spend a long time with their parents, forming a family group. Birds such as housemartins and blackbirds have second and third broods in the same year. These youngsters become independent much more quickly and it is important to stop hand-feeding as soon as possible to allow this natural independence to develop. Jackdaw nestlings are another routine admission at the Hospital. Nests are often built on chimneys and many nestlings arrive as a result of chimney cleaning. This could easily be avoided by fitting a cowl on the chimney to prevent the nests being built. Once they are feeding independently in the rehabilitation aviaries, they are left well alone, but spend a little longer in the aviaries before being released as a group. BLUETITS also raise one brood a year. The youngsters fledge after 15 to 23 days in the nest. Again, it is vitally important not to talk to these birds while feeding them and they are moved into a rehabilitation aviary as soon as possible. Adult bird casualties are already equipped with the skills needed to survive in the wild. The capture site is a vital piece of information. An adult bird will know its own territory and should always be released where it was found to have the best chance of survival. 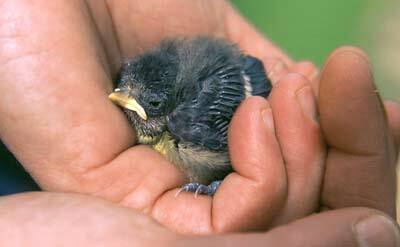 Gower Bird Hospital's minimum contact policy is just as vital for adult birds as for nestlings and fledglings. All wildlife has a healthy, instinctive fear of people and an already ill or injured bird needs peace and privacy to recuperate. Again, a good understanding of the individual's natural history is essential. What does it eat? How does it feed? What sort of habitat does it require? Herons, for example are very easily unnerved and their immediate reaction to being startled is to fly away. Obviously, while in temporary captivity at the Hospital they can't fly away so their next reaction is to vomit any food they have eaten. We provide a seclusion area at the Hospital for these nervous birds with a small pool for the heron to wade and find the freshly defrosted fish supplied. Staff enter once a day to medicate and replenish fish and fresh water. Observation is through the CCTV system, causing no disturbance to the heron, ensuring it recuperates as quickly as possible. Water birds always need our aquapens - aviaries with pools and shelter areas. Free access to water is essential for keeping plumage waterproof and also for the birds to simply rest by floating on the water, taking the weight off their legs. Small injuries to the feet can result in bumblefoot - a very painful infection which can spread into the bone and is very difficult to treat. Therefore we cover all hard, flat surfaces with Astroturf to prevent callouses forming on the feet. In the wild, gannets dive at tremendous speed from high up in the air straight down into the water to catch fish. The beak has no external nostrils because of the extreme pressure when they hit the water. When handling a gannet the beak is very powerful and could cause serious injuries to an inexperienced person. Some people make the mistake of taping the beak closed to prevent injuries. One poor gannet arrived at Gower Bird Hospital having been put into a box with its beak taped, resulting in the poor bird dying of suffocation before it reached us. 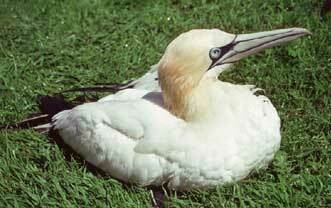 Gannets arrive at Gower Bird Hospital, usually with no injuries but very thin and exhausted. They spend time in an aquapen, sometimes having to be hand fed whole mackerel until they start eating the fish for themselves.